Burnished red, gray, and buff slip. Protoclassic, ca. 100 B.C. to A.D. 250. This crouching female figure, wearing a red skirt in open relief, rests her chin on her left knee alongside her left hand, the right hand resting upon her lap. She is adorned with multiple ear ornaments decorated with red slip, and has naturalistically formed lidded eyes, nose, and mouth slightly smiling. Provenance: The Charles Craig Collection of Pre-Columbian Art, Santa Barbara, California, formed during the 1960s-‘70s. For comparable types, please see Kan, Meighan, Nicholson, Sculpture of Ancient West Mexico, Nayarit, Jalisco, Colima:The Proctor Stafford Collection, P.120, Cat. No. 88, LACMA, Los Angeles, 1970 & 1989. 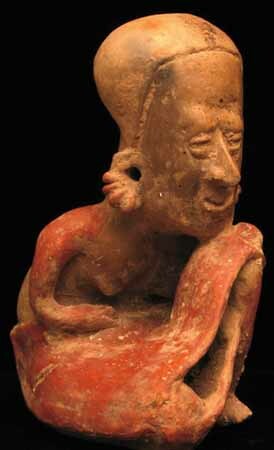 See also, Von Winning, H., The Shaft Tomb Figures of West Mexico: Figs. 147-149, Southwest Museum, Los Angeles, 1974.